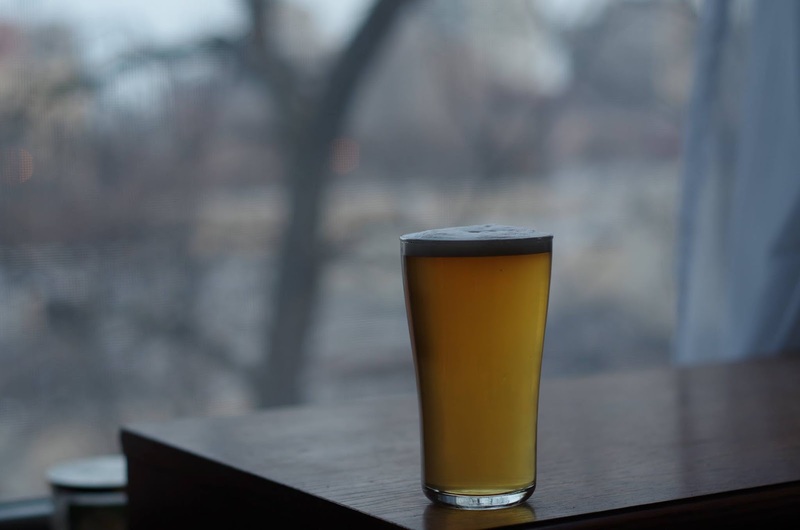 Since there are so many excellent IPAs and pale ales available on the shelves in Chicago, I don't find myself brewing those styles very often. I will say, though, that the batches I've made after purchasing a basic kegging system are considerably better than anything I made before. Its not just that the kegs allow me to avoid introducing oxygen during bottling. I can also ferment in a keg, transfer using CO2, and dry-hop under pressure, so that the beers never really sees any oxygen exposure after brew day. I can't take any credit for the process, which is a variant on the one described at Bear-Flavored and Ales of the Riverwards. The only difference is that my small batch size (3 gallons) means that I can also do the initial fermentation in a keg with an open spunding valve (I haven't tried fermenting under pressure yet), and then transfer to a new keg for dry-hopping and serving. So far I've been suspending the dry-hops in a couple of weighted mesh bags, but if I brewed these beers more frequently, I'd probably give Scott Janish's loose dry-hop method a try. 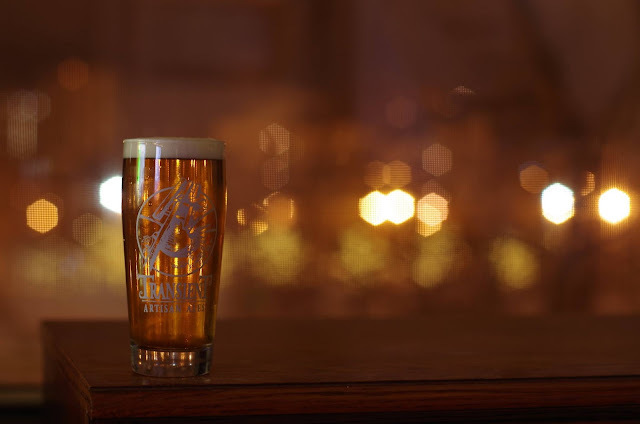 The beers below were all brewed at least seven or eight months ago, so the tasting notes are based partly on things I noted at the time, and partly on memory. I haven't re-brewed any of these beers since these initial batches, but I'll probably make a variant on the IPA recipe for guests once the American football season starts again in Autumn. So much juice! Sweet orange, lime, touch of lemon and a little mango. This is super fun to indulge in, I want to wrap the glass around my nose and smell it all day. A super faint hint of grassiness, but this is more herbal than anything. Bottle is clean but has a deep cap impression. Extra clear and blond, little cloudiness but still some gas character to make it interesting. Moderate lacing, excellent head retention throughout. Those citrus and tropical aromatics carry through, helped by a lively carbonation. A sweeter, dry finish accentuates but dominates the body. There is a faint berry here, but little to none malt presence. Neutral yeast character that carries well, or is masked by the hop profiles. Let's just say this is a delightfully alcoholic citrus fruit smoothie. Love the aromatic complexity. Wish there were more maltiness, or rather a drier, less sugary smack. I think it could use a touch more bitterness; I could see mellow bitterness working well here. Reminds me a lot of late hopped beers. "Drink early and drink often." This beer was a variant on Ed Coffey's HopsHands recipe. Back when I made this beer, there weren't many versions of this new kind of pale ale available in Chicago, so I thought I'd make one myself to see what all the fuss was about. The first batch didn't turn out so great. I forgot to restock flaked oats (which make up a large portion of Ed's recipe), and ended up subbing wheat malt for most of them. I also added a fairly large dose of calcium chloride to the brewing liquor, pushing it up to around 140 ppm. I don't know if either of those things were the cause, but the first batch had an astringent bitterness that I found pretty unpleasant, and that didn't seem to fit at all well with the way people described the style. Since I felt like I hadn't done justice to Ed's recipe, I decided to make another batch with the proper grist, and slightly lower chloride additions. This one turned out much better: dry, juicy, murky, and aromatic, as these beers are described. 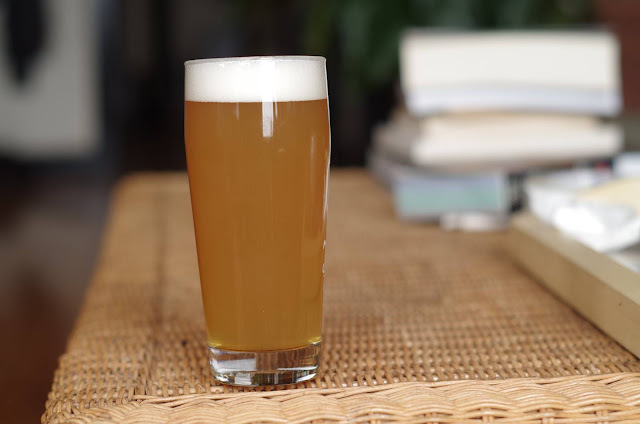 It was a fun recipe to try out---I've been using Wyeast 1318 for a few years, and it always drops bright, so I couldn't believe people were using it to make such murky beers until I saw it with my own eyes. However, based on this batch and some other local interpretations I've tried since, I'd say these beers aren't really my thing. A single glass made a strong impression, but I just don't find them very drinkable in the long run (I would never drink three pints of juice in a sitting!). I guess I just want some moreish bitterness in my beers. This was a fun little experiment with some Kolsch yeast. I basically just wanted to make a dry, bitter Kolsch, and in hindsight I think I should have pushed the bitterness up higher to around 40 IBUs. Fermenting in the low 60s gave it a fairly subtle ester profile, and as I recall, the keg was finished quickly by me and some guests. If I had cause to use a Kolsch yeast regularly, I'd certainly make this again. If you ever plan on relying on whirlpool hops for bittering, I recommend adjusting your utilization factor. I've adjusted mine down to around 25% compared to the Beersmith default of 50%. I still don't think I'm there yet though. The 25% value I think is decent at predicting the bittering for additions immediately after flameout (no cooling). I have yet to determine an estimate for lower temperature (< 185) whirlpool additions. Thank you for sharing the article. Glad to it.